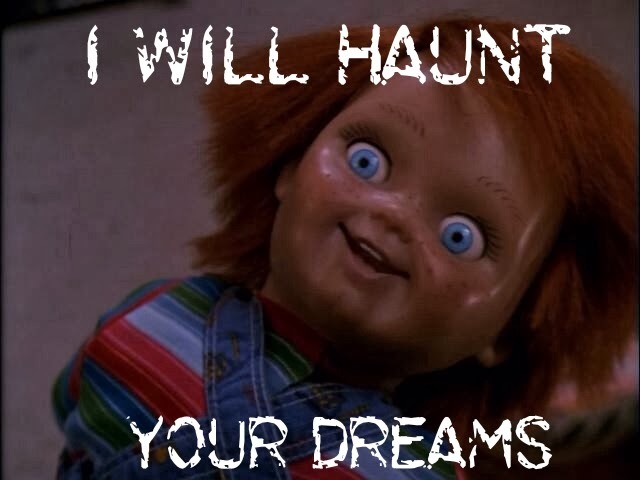 Once when I was younger my parents were watching Child's Play. I'm not sure why since it still doesn't seem to me that it would be something they would enjoy. But it was the late 80's so I'll let it slide. I was supposed to be in my room being a good child while they sat uncomfortably (I would say entertained but I don't think it's accurate) through the movie. I, being a curious and daring child, decided I needed to see what this weird doll movie was all about. So, peeking around the doorway from the hall to the living room, I watched parts. I got caught a couple times and was told to go back to my room. But I would not stay there... oh no, I had to watch it. Sitting quietly on the horribly awesome green, yellow, orange and brown shag looking carpet, I peeked around the corner again to watch more. Which is when I'm assuming (my memory blocks that part from me) someone was horribly murdered by a doll. Horrified with what I had seen I ran to my room that, much to my dismay, contained a massive amount of dolls. You can imagine my terror at this point. I was surrounded by possible murderers! He gave me a scenario and asked what I would do. This scenario did not help lessen my fear. He asked something along the lines of "what would you do if the cat (who I was sitting by at the time) kept coming back to life, etc" and he basically proceeded to tell me the plot of Stephen King's Pet Sematary. Really, Dad? How is that supposed to help in this situation? Of course, I didn't realize what he was telling me until many years later when I was actually old enough to watch scary movies. And then I felt a little upset because Dad had ripped off the plot of a Stephen King movie. 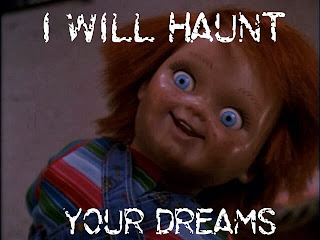 I think he's forgotten he did that but I am still afraid of Chucky and have yet to go to him again when I was scared of a movie.